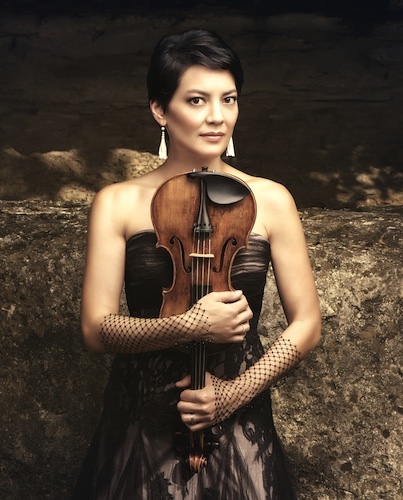 February 26, 2014, 7:30 AM · Just more than a year ago, Anne Akiko Meyers was granted lifetime use of the 1741 "Vieuxtemps" Guarneri del Gesù, an instrument that at one time had an asking price of $18 million. Earlier this month Anne released an album that is her debut recording with the "Vieuxtemps": The Four Seasons: The Vivaldi Album, with the English Chamber Orchestra, conducted by David Lockington. Laurie: This is the coming-out party for the "Vieuxtemps" Guarneri del Gesù; what made you want to record Vivaldi and not say, Vieuxtemps? What drew you to "The Four Seasons"? Anne: One reason was that I discovered an eerie coincidence: that the "Vieuxtemps" Guarneri del Gesù was "born" in 1741, and Vivaldi died in 1741 -- the same exact year! Imagine, here were these two northern Italian geniuses, who most likely never met, really working their craft at the same time. And in both cases, their works were undiscovered, for centuries. Now their works are considered masterpieces in each medium -- violin-making and music composition. It was so enthralling to me, to discover that. Laurie: It's interesting that they dovetail like that. And at this point, "The Four Seasons" certainly no longer seems like an undiscovered work! Is it a piece that you have played for a long time? Anne: "The Four Seasons" has always been a part of my DNA -- I grew up listening to it, and I've played it a lot. Whenever I have a recording project on my plate, I love to start from square one, if possible, and just have an absolutely fresh, clean palette. I research what editions are available, the history of the piece. Everything is pretty much a representation -- even with the Bach. There are no rules in place. It's really up to the musician to instill his or her vision and to decide the rules to play by. When you start from square one with such an iconic piece of music like the Vivaldi "Four Seasons," you go on a journey; it's an adventure and you're never really sure where you're going to end up. Laurie: Did you discover any really interesting editions? Anne: These pieces were written as part of a set of 12 violin concertos, and it was originally entitled, The Contest Between Harmony and Invention. Op. 8. Strangely, it was published in Amsterdam. There are other publications as well -- I looked at the Ricordi publication, thinking the Italian publication had to be the correct authority. But the music for "The Four Seasons" was lost for a very long time; most people didn't even know it existed until the 1920s. The work of one man really saved the bulk of Vivaldi's compositions. So when you're talking about "The Four Seasons," you're dealing with a lot of mystery. When it comes down to it, we just don't have much information on Vivaldi. We are so enamored with his compositions, but we really don't know much about him. I feel the same about Bach. That's just kind of the way it goes with these composers that lived in the 18th and 19th century: we don't have that kind of information accessible. Laurie: Who is that one man who saved Vivaldi's works? Anne: His name is (Alberto) Gentili. Laurie: Where did that happen, was it in Italy? Anne: It was discovered in a monastery (in Piedmont), all this music, hidden in big tombs -- like old trunks, steamers. He took it upon himself to save the music, and to have it re-published. There was one recording of "The Four Seasons" made in the 1920s, but it really wasn't until Louis Kaufman -- the man who did "Gone with the Wind" and was the concertmaster to all things Hollywood -- recorded it in 1947 and 1950 that it was really put down on record properly for the first time. That's hard to imagine now, with so many millions of recordings available, and everyone's version being "authentic…"
I think that when you study the scores, you realize that what made it so stand-apart and so different was the fact that Vivaldi penned these sonnets. That was really unusual at the time, to write poetry to accompany the music that was written. And the sonnets are so incredibly descriptive; they describe how the music should be played and heard. That's so unique. Laurie: It's sort of freeing, I imagine, because it's another direct guide that the composer gave, another instruction beyond the written music. Anne: Exactly. For example, play like a bird, play like a goldfinch. I actually looked it up: What does a goldfinch sound like? And it really sounds like the way he wrote the music! Then I listened to a lot of different recordings and I thought, wow, that's their version of a goldfinch. Everyone's version of a goldfinch is very different, sometimes very different from the actual thing! Laurie: There no "correct" Baroque way to play a goldfinch, I suppose! Anne: That's where beauty lies in the beholder, and even just listening on Youtube to a goldfinch singing, it sounds so different to us all. So this recording is just very personally my version. Laurie: When was it that Gentili discovered all this? Anne: It was back in the 1920s, that the discovery was made and the music was unearthed. It's really fascinating because when you think of the "Vieuxtemps" (del Gesù ), the "Vieuxtemps" was sitting under a bed for the last 50 years, too. (Henri) Vieuxtemps had (the violin) at the end of his life. Unfortunately, he suffered several strokes, and he couldn't perform much any more. Yet he was so in love with this violin, he just tried to compose as much as he could. Still, he missed being around music, and even his class was taken over by (Henryk) Wieniawski. On Vieuxtemps' funeral day, this violin was carried on a pillow by his pupil, Eugene Ysaye. It's so fascinating -- all that fate and destiny, speed-rolling to 2014, and it's the first time that the Vieuxtemps (violin) is being recorded professionally. This music that everyone feels they know inside out, this may be the first time it's ever been performed on the "Vieuxtemps" (del Gesù ). Laurie: That's very possible, if it was in a vault for 50 years. For some reason I had the impression that people had been playing Vivaldi, straight through, for the past 300 years! Laurie: Tell me about this "Concerto for Three Violins" by Vivaldi. As I understand it you recorded all three solo parts on the del Gesù. Anne: I'm a glutton for punishment -- that just took so much work to record! I guess I wanted to out-do the (Bach) Double and see what a triple would be like. Don't even ask about a quartet, that will never, ever happen! Laurie: What are some of the challenges of doing a trio with yourself?! Anne: (she laughs) I discovered the Triple, and was just blown away by the rich writing. I think it's on par with the Bach Double; it's just that good. It's hardly ever performed, and I'm not sure why. It has one of the most beautiful melodies in the second movement, where the third violinist has the melody. I thought it would be an interesting challenge, to show all the facets of the violin, what it could do as a trio! Then the Pärt -- Kristjan Jarvi introduced that piece to me, and I learned it when I played in Estonia last summer. It was so good, I fell in love with it and I felt it was perfect for this album. People might ask, "What? Pärt with Vivaldi?" But it is a Baroque-inspired, "Passacaglia." It's almost like a palette-cleanser, with so much Vivaldi on the album. (The Pärt makes you sit up and listen to the Triple a little more carefully. Laurie: A little sorbet in there. (The Pärt) sort of shivers a little at the beginning, almost like "Winter." It did make me think of "Winter," and then I noticed -- I wondered what the orchestration was, did I hear a celeste in there? Anne: It's a vibraphone -- we had to get that instrument there especially for the piece. Laurie: I thought, "Harry Potter's just flown in!" for a second. Anne: (She laughs) It's a vibraphone. Laurie: I'd never heard this piece before. Anne: I'm going to be doing a version for two violins and stringed orchestra, with Vadim Gluzman, this June. It will be interesting to learn the second violin part. Arvo Pärt's music is so profound and so compelling -- he just says so much in such a short amount of time, it's so powerful. Even the ending of that piece, it almost sounds Mediterranean-Arabic -- you're not really quite sure where it's coming from, but the form is "Passacaglia"-style and the inspiration is Baroque. I think that he respects the old tradition, but writes such original music in an old style. Laurie: I have another question for you, unrelated to your album. I wanted to ask you how you feel about what happened to Frank Almond. You are the owner and caretaker of three very valuable violins, and I think we all have been very upset by the theft of the "Lipinski" Strad, though happy that Frank is okay and the Strad was returned. I wondered what your take on it has been. Laurie: Have you had that before? Anne: Yes. Absolutely. You can never be safe enough. Not only was it shocking that he was assaulted, but when I read that the violin was taken out of its case and it was 25 below zero, my heart was on the floor -- the violin! You really think of the violin as almost a living entity. Laurie: One recurring comment, in all the follow-up to this incident, was that if you have a violin like this, you simply should not tell anyone, keep it a secret. Don't be high-profile about it. But to me, it seems like, as the caretaker of an instrument like this, one almost has a responsibility to share its history and perform on it in public. Anne: I don't think it's even possible to say that you can't talk about it. I'm almost daily doing an interview about the "Vieuxtemps," and everyone in this world knows that I'm performing on it. That's part of the mystique, also, of every performer I've seen: what violin do they use? It's in the reviews; it's just part of your identity. So I think as musicians, we have to be careful -- and it's not just the violins, it's the bows as well. These are expensive items that we have worked our whole lives to try to play. We appreciate the history of these makers and what they went through to make something like this. These instruments are meant to be heard; they're not meant to sit in museums. If that protects the instrument, keeping it sitting in a museum, that's so ridiculously sad. Laurie: Because there is an entire dimension of its existence that can't unfold. Anne: They were made to be played on; that was the whole meaning of what these makers went through to create them. Of course, there's a point of over-use, and I'm very aware -- I'm selective with my dates, because I don't want to be performing on it 150 times throughout the year. But I'm so happy that Frank is okay and that the violin was returned. I also think it drills in the fact that something like this can't be done. You can't just steal a violin of high worth and try to pawn it, it just won't work. You can't get far with it at all! February 26, 2014 at 07:46 PM · hi Laurie, you linked to the American Goldfinch, which is quite a different species (even belonging to another genus) than the European Goldfinch which is most probably what Vivaldi was after. February 26, 2014 at 08:35 PM · Thank you, Laurie, for another great interview! It's interesting to learn more about Vivaldi and his works. The triple concerto is one that I previously wasn't as familiar with. Now I think it may be my favorite part of The Vivaldi Album (especially the 1st movement).